The number of people killed by a typhoon that slammed into Taiwan and China earlier this month continues to rise, Taiwan announced Thursday. At least 543 people are now known to have died when Typhoon Morakot hit Taiwan, the country’s Central Emergency Operation Center said Thursday. At least 117 people are still missing, and at least 46 people were injured. Emergency services also reported that 60 human limbs had been found, separately from the number of dead and wounded. 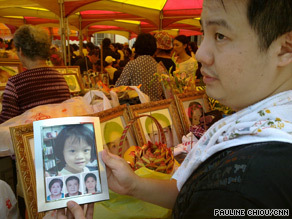 Kaohsiung county was the worst hit, with 472 dead, 72 missing and 13 hurt, one seriously, the emergency center said. Morakot dropped 102 inches of rain on Taiwan August 8 before it roared on to mainland China the next day. More than 1.4 million people in China were forced to relocate because of the storm and more than 6,000 homes were destroyed. At least six people were killed there, China’s Ministry of Civil Affairs said after the storm passed. Taiwan President Ma Ying-jeou apologized last week for the slow response to the typhoon. He said he plans sweeping changes to the country’s rescue agencies and may punish some government officials. “We will try our best to do a better job in the rescue work that has been criticized for being too slow,” said Ma. “There are things that we have to correct and we also will be responsible for whatever mistakes or neglect that government officials have made.” Rescuers have struggled to locate many who were missing in remote mountainous areas of southern Taiwan. Ma also apologized a week earlier for failings of the rescue effort as he traveled around the typhoon-battered island. He said heavy rain grounded rescue helicopters in the first few days after the storm hit, delaying relief efforts. Ma said the storm destroyed buildings, homes, roads and farms, causing about NT$100 billion (U.S. $3 billion) in damage.